Before a gate knocked him dead, 77-year old colonial Nairobi farmer, Mr J.K. Watson had faded into oblivion. Even today, very little is known of Watson, and libraries have since discarded his pictures, mementos, and all that he stood for. Yet, no Kenyan has never seen the cattle dips that this man helped design in the countryside, or heard of Doonholm Estate in Nairobi where it was all began before spreading countrywide. Still, this was the man who helped in the actual construction of early churches in East Africa and the most notable so far has remained Namirembe Hill church in Uganda. That, some might argue is the reason why Doonholm Estate in Nairobi has interestingly refused to give up its colonial name. The only time it did was when the former Doonholm Constituency (actually Watson’s Farm) once represented by Mwai Kibaki, changed its name to Bahati (and later Makadara) and when Doonholm Road became Jogoo Road shortly after independence. I have always met people who wonder why an estate in what was exclusively an African neighbourhood has such a name or its place in this country’s history. Let me try to reconstruct the reasons. Although now a residential area, Doonholm was previously a dairy farm known still as Doonholm Estate, and named after Glasgow’s Doonholm Estate where its previous owner, J.K. Watson hailed from. Initially a 4,600-acre farm that stretched from the eastern edge of City Stadium towards the modern-day Doonholm Estate this was the first place in Kenya to have a cattle dip and to initiate a serious experiment against east coast fever. It was also the place where the first breeds of Ayrshires, named after Watson’s birthplace, Ayr, were first tried in East Africa earning him many trophies including a prestigious Gold Cup given by East African Standard. From that perspective, it would be interesting to look again at Doonholm Estate and appreciate its place in Kenya’s dairy history.. Watson, was not ordinary colonial settler and had been one of the few architects and constructors whose passion was to construct roads and houses. Perhaps long forgotten is that this was the man who dug up the cotton soil at Nairobi’s Kenyatta Avenue and laid foundation for what the road is still today. Thus in terms of drainage, and design Watson gets most of the credit for laying the Avenue, then Sixth Avenue, which is the widest of all in the city. Also, when he found that he could not supply milk to the city – he was the first milk-man for Nairobi City- he decided to build a murram track that he named Doonholm Road and which is today known as Jogoo Road. Doonholm Road was running through the farm and linked it to the city and that is the reason why it was at the edge of African estates that were built to accommodate the African labour force. But it was his desire to breed grade cattle in the region, even before Lord Delamere, that made him well known in the white-elite circles although his legacy later cut across the racial divide. At Doonholm Estate, Watson had an office – nay house- where most of the famous buildings he later built were conceptualized. Among the most notable buildings is the famous Namirembe Church in Kampala, and the YMCA buildings in Nairobi. 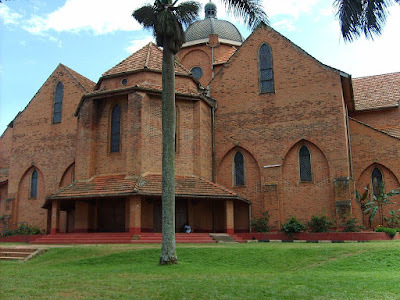 Namirembe, which celebrated its 100 years in 1997, is the oldest Diocese in Uganda, and the construction of the church there by Watson turned the hill to become the cradle for Christianity in Uganda. From Uganda, Watson also built the building now known as the Kenya National Archives, and residential houses in Muthaiga before he quit to concentrate on farming at Doonholm - considered the edge of Nairobi. And like the powerful architecture that he gave the town of Nairobi, his contribution to farming was remarkable although it is the designing of cattle dips in Kenya that went to annals of history for a man who had been bluntly told in 1903 that there was no land for faming in Kenya. Initially, his stock had started to die of east coast fever and Watson was told there was no cure and that if he had to control the ticks, picked from the Athi plains, he had to build dipping tanks. Records show that he ordered the first drums of chemicals from Coopers and were delivered by Messrs Newlands and Tarlton. From then on, Doonholm became an experimental farm and one of the memorable notes written to the Agricultural Society of Kenya, of which he was a pioneer acknowledged the role of Watson in East Africa. The letter dated August 4, 1913 says: In time to come when the history of the stock industry in British East Africa comes to be written, as assuredly it will, it will always be remembered that J.K.Watson (of Doonholm Estate) was the pioneer of stock dipping in the protectorate”. Interestingly, and like the disappearing cattle dips in the countryside, Watson’s name has not had any luck. But Doonholm Estate lives on, not as a livestock far, but inhabited by people who Watson had, perhaps fenced out! my history is definetely rusty. very interesting, and informative. Re - Doonholm keeping it's name, Yes please - I am one of James Kerr Watson's Grandchildren, now in my 40's living in england but as a family we have always been intrigued by the tales of our colonial settler ancestory. It's part of our history but also part of a bigger picture that was instrumental in creating part of the history in Nairobi and other parts of East Africa. My brother - Douglas Watson lives in South Africa where he has named his plant nursery Doonholm Nursery - so the name lives on for us as a family as well; I have 2 sisters one in South Africa, - and one in America, We all got together for a family reunion in the UK in 2006 where part of the occasion was to share photos and knowledge of our heritage, between us we have pictures/memoirs from our own Father (Nicol) who continued to manage the Farm until we left Kenya in 1967, and headed for South Africa. But in the busy lives we lead, it is still our intention to find time to collate all our evidence together, as well as link up with other family now dotted around the globe including James Watson, junior, another grandson, but from JK's first son, (Hamish), now living in Australia. Would love to help in keeping not only our personal history alive, but ensuring this can be accessed by future generations to come. Further postscript - my son - Matthew Gatehouse is ocnsidering training to be an architect, too much co-incidence - so perhaps JK Watson's skill has filtered down through the gene pool.